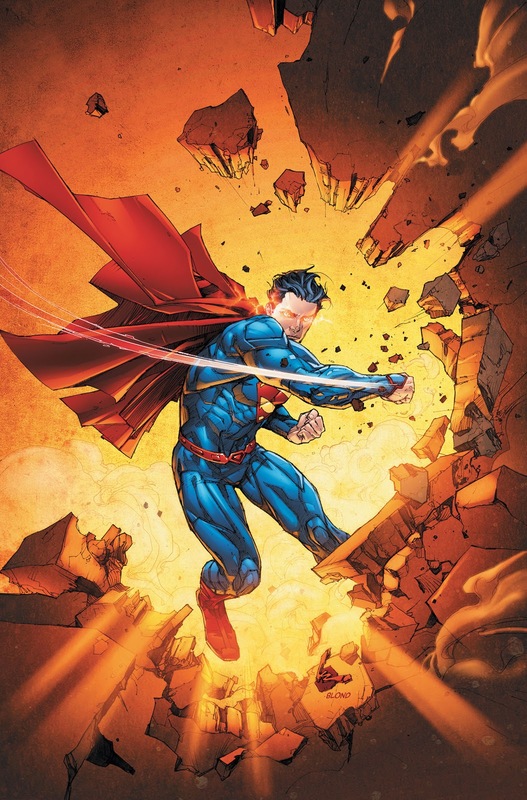 Since DC Comics’ relaunch of its superhero titles, The New 52, began over a year ago, Superman has been a book that has lacked a clear direction and any kind of consistency. George Perez managed a lacklustre six issues before Keith Giffen and Dan Jurgens handed in another entertaining but inconsequential six issues. Scott Lobdell has been the new writer for the past two months, with Kenneth Rocafort on art. So far Lobdell and Rocafort have given us Superman Annual #1, where they spent far too much time telling us that the villain Helspont is a badass and not enough time on the Man of Steel, and Superman #0, a fantastic issue set on Krypton that featured Superman for only one page. It was with some trepidation then that I approached Superman #13. After all, Lobdell and Rocafort had yet to fully demonstrate their vision for Superman and based on their two previous issues I honestly felt that the quality of the book could go either way. I needn't have worried. Superman #13 was absolutely brilliant. Lobdell's Superman is actually Super! The issue begins with Superman bench-pressing a planet for five days straight. This is the kind of super-feat we haven't seen for literally decades in the pages of this book, and it's just the start. Perez' run on this book suffered from Superman having to fight some pretty generic monsters. Lobdell has Superman fight a truly impressive monster that manages to knock him halfway around the world. The monster's effectiveness has a lot to do with Rocafort, who really conveys the scale of the beast, and makes it look truly unique. Lobdell also has Superman use his super-hearing, heat vision and Arctic breath in ways that I have never seen him use them before. This is a refreshing change from the way we usually see Superman utilising his powers; pointing and shooting in the midst of battle. It's Lobdell's depiction of Clark Kent however, that really stands out in this issue. I finally recognise this Clark as the one I've been reading about in Grant Morrison's Action Comics. Morrison's Clark is a bit scatty with his personal life, a bit younger and a bit scruffier than we're used to seeing him. The Clark we've been seeing depicted by Perez, Giffen and Jurgens seemed more mature and a lot like Superman was before the reboot. There was nothing wrong with their depiction of Clark but it seemed inconsistent and far removed from the fresh, new vision that Morrison was giving us in Action. Lobdell on the other hand has really embraced the New 52 and gotten completely on board with the new version of Clark. Lobdell's Clark, like Morrison's is scruffy and disorganised but joyful of his powers and most importantly, passionate about justice and the truth. There's been a lot of hype about Lobdell's decision to have Clark quit the Daily Planet. The scene in which Clark quits is so good it makes me glad that the eyes of the world have been drawn to this issue. Clark does the kind of walk out on his job that we've all dreamed of doing at some point in our life, telling his boss off while fuelled with righteous fury, with the eyes of his co-workers on him. But this scene is a lot more than just wish fulfilment for down-trodden employees everywhere. Here in the UK we've recently seen the reporting of the horrific sexual abuse committed by deceased TV star Jimmy Savile derailed by discussions of how his former employers, the BBC made the absurd decision not to report on his crimes just after he died over a year ago. Over the past year we've also seen just how low the press are prepared to sink in pursuit of a story, with revelations and allegations of journalists hacking phones and bribing the police dominating the headlines. Clark Kent, the embodiment of honest journalism, standing up in the middle of the Daily Planet newsroom and saying “Somewhere along the way the business of new became the news!” conveys a particularly important and resonant message that needs to be shared. Rocafort's art is absolutely beautiful and the effectiveness of Clark's speech has a lot to do with him. Rocafort successfully conveys the power of Clarks' righteous fury but then swiftly turns it on its head when it becomes apparent that Clark is a lone voice. 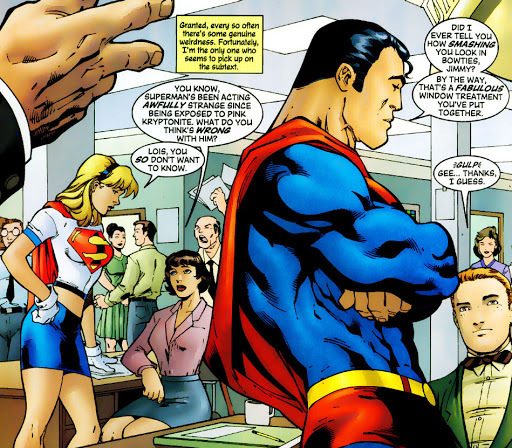 The panel containing Clark's speech dominates the page, with each panel getting subsequently smaller as Clark realises that none of his co-workers share his passion and he has to take a lonely walk out of the building. My only minor problem with this issue is with Lobdell's characterisation of Cat Grant and Perry White. I would have preferred that Cat had not been depicted as a complete airhead, as traditionally she has always been a far more interesting character. To be fair though, she is the only one who follows Clark's principled stand and Lobdell may have some character development planned for her somewhere down the line. I am convinced however that Perry White should really have had a lot more to say to a reporter he respects besmirching the name of the paper he loves. Overall though I loved this issue. Lobdell's Superman is lots of fun and for the first time it feels like this book has truly joined the New 52. Based on this issue, I believe that Lobdell should have been writing Superman from issue #1! I give Superman #13 4/5. It's already attracted a lot of anger on Facebook, some of it is quite amusing. Now, I'm by no means saying that if you disagree with this article then you're homophobic, but if you disagree with this article by typing "Superman has always stood for the America Way...Not the American Gay!" (as one Facebook commenter did) then you probably are homophobic. Keep checking out World of Superheroes for more of my articles. And also, just keep checking it out anyway because it's a great website!